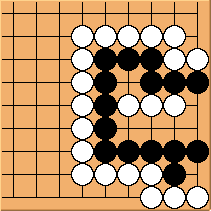 I just played a game on IGS in which there was a seki. 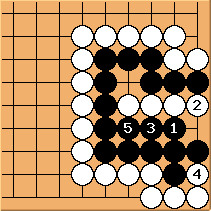 My opponent kept marking my stones inside it as dead and claimed it was not seki. How does one resolve this situation on IGS. If I leave the game I am marked as an escaper and lose the game. After I did an undo 5 times the game was adjourned. What happens to it now? That happened to me as well. I stopped using IGS after that. The point change due the seki being marked dead determined the outcome of the game? I dont know of any resolution within the structure of IGS. I am afraid that it may be like many places in life: there are people worth knowing and those to be avoided. Protecting your own reputation by forcing the game into adjournment may be the best that one can do. We dont have a world in which those best avoided are marked as such. C'est la vie. Chris: As hypothetical play has not been implemented in IGS, the best option is to convince the opponent. I have rather good experiences with this. The most important thing is not to get into a "I'm right", "No I'm right"-like debate. In the case of DrStraws conflict he could say to the oponent "I think this is a seki. Could you tell me what move you would use if you had to capture my stones explicitly?" This way you can resolve the conflict by hypothetical play. In most cases the opponent is not trying to cheat and you shouldn't assume that (s)he is unless you are certain. I remember a case where I myself was on the wrong side of such a conflict, although I might have looked to the opponent like I was cheating this was not the case. I was really very tired at the time and therefore thought that two groups were connected to each other that really weren't. He tried to claim that would kill my stones because if I play I get a 4-row inside his territory and so he is alive when he captures, whereas if I let him play then he has two eyes. He apparently could not see that he cannot put me into atari to capture the stones. Anyway, I was wondering, does IGS record the game as a loss for me because I am the one who did the undos? Or is this a bug which will allow anyone to escape a lost game without penalty? Now, 24 hours after the game was adjourned, I logged on and found I had been awarded the game. I have no idea what is going on! Really? That would be very surprising. This is probably not an unusual occurence and I cannot see someone spending time resolving such issues manually.